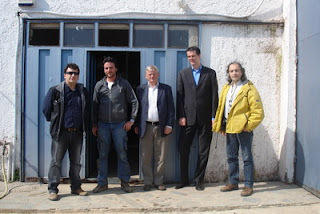 April 16 - 19 2007, Maurice Husson the new Managing Director of the Grodan Group accompanied by Mr. Sting Nielsen, Sales Division Manager visited Greece in his road show trip. In cooperation with Mr. Evagelos Drimtzias, Regional Account Executive those days they visited greenhouses with various vegetables and flowers crops in Peloponesse and Attica regions in their attempt to stay in touch with the value chain players (Grodan growers, dealers and local agricultural supplies stores). In addition they met with the staff of the DKG Ltd that operates as Authorized Technical for Greece and Balkans and were very satisfied with this collaboration that is strengthening the leading position of Grodan as solution provider worldwide. As Maurice stated: "The horticultural market is very professional and constantly moving. Enlargement of scale, internationalisation, automation, food quality and energy prices have an impact on growers worldwide. We notice in all countries where we co-operate with growers, that they aim for improving the quality and quantity of their horticultural products. Grodan, therefore, focus their strategy on supporting growers by qualitative and innovative products, services and advice. Since the 70's, Grodan has been the trendsetter in the area of substrates, which is a position you can only claim when offering the best products and services. Given my background and experience, I will be able to contribute to the quality of our organization and portfolio. Moreover, I see it as a challenge to position Grodan's solutions worldwide even stronger in the market." Photo: From left: Evagelos Drimtzias, Giorgos Katsagonis (Grodan roses grower), Stig Nielsen, Maurice Husson and Christos D. Katsanos.